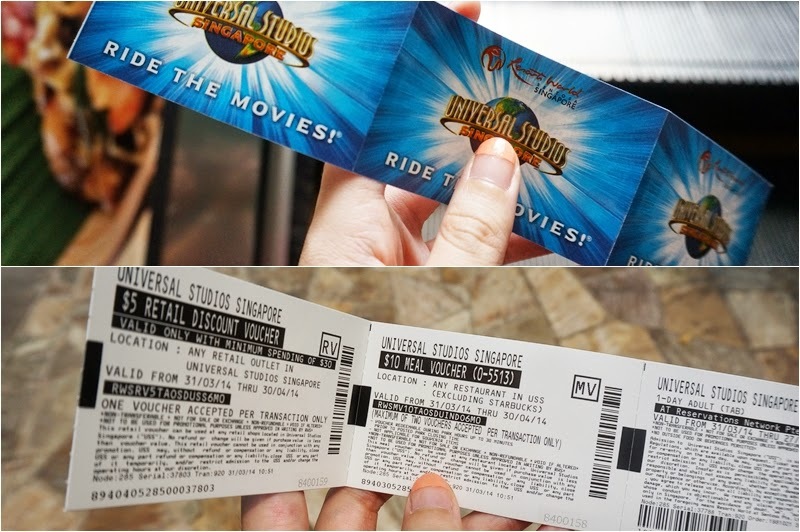 Universal Studio Singapore (USS) post is finally here! I just realize I didn't take a lot of pictures to be posted here, quite regret now and I'm a truly fail tourist when I get affected by the weather; you know I really hate broiling weather, once I sweat then here gone my mood. The weather didn't treat me well throughout my Singapore trip, I sweat and every photos I took after that are so ugly and not presentable to be shown here. So don't expect to see my face on these post lol. Nonsense no more, let's back to the topic. We were at USS after some rest and shower at Hotel 81, we reached there around 1pm, many of you might say I should go there on the next day I reach Singapore so that I'll have more time to play all the theme park games. We thought of that too but we decided to go there on Friday to avoid the expected heavy crowds on weekends and to save some time from queuing. Looks like we are right! The entrance fee is around $74 if you get it from USS, if you want to skip the queue, you can buy the ticket online before you go there. We got our ticket online from Asiatravel which cost only $65, together with the ticket, we also get the $5 retail discount voucher and $10 meal voucher. Once you bought the ticket online, all you need to do when you arrive the park is to collect the ticket from their kiosk nearby the bus station. We spent some time to locate the kiosk as we not really know where is the bus station in USS. We were here, the signature globe that you must take a shot whenever you are in USS, glad that it's not as crowded as I thought, seems like we made a correct decision to be here on Friday. It was quite hazy when we were there, not sure why. First thing we did in USS is to hunt for food, we didn't get anything for our tummy after breakfast, pity them. There are total of 7 zones and each zone is with own themed restaurant; we didn't care about that and the first restaurant we saw is Mel's Drive-in at Hollywood zone. The food is not bad and I think it is yummeh, or maybe I was just too hungry; better than McD I would say. You get to see many designed truck along the streets which sell small bites and beverages, they surely are picture-worth for me. Our first ride - A Crate Adventure at Madagascar. Don't feel to get the fury ride first after our lunch, as I might puke my burger during the ride. It's some kind like a river boat ride, and you get to know the Madagascar full story throughout the ride. The Far Far Away Castle and we were so lucky to see the Shrek and Princess Fiona in real, everyone even aunties were so happy and followed the ogre just to take a photo with them. I think we spent most of our times in Far Far Away, we played most of their rides and shows, personally think that the Shrek 4D Adventure is awesome! Okay, we kinda skipped the whole Lost World and Ancient Egypt as I really don't enjoy the fury ride, I have a weak heart, even the rides in Genting Highlands would kill me, the rides in USS would kill me more. I really enjoyed seeing these building, aren't they look great? The ride that I love the most is TRANSFORMERS THE RIDE, I was cheated by the front few rows and thought that no one were queuing, once we get into the building and we just realized they queue was.... okay, it's worth queuing. It was awesome and I feel to get another ride, it's like we really fighting inside together with Autobots. I'm totally in Transformers fever now as the Age of Extinction is up on next week, I got my ticket already, have you? 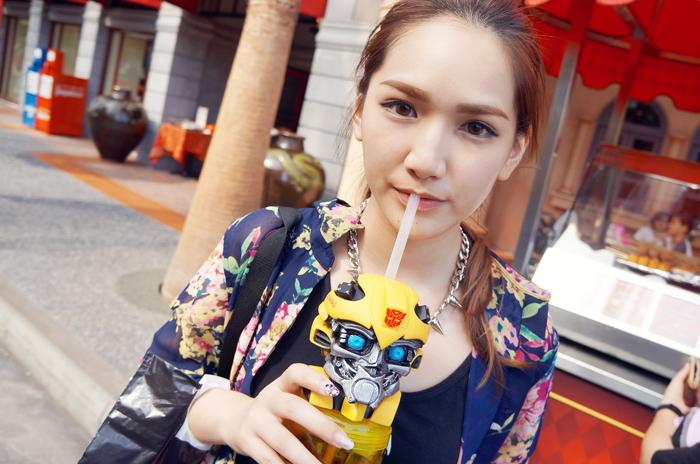 My main purpose to USS was to get a bumble bee water bottle like the one that owned by janechuck, I walked around the area and couldn't look for one, all I found is this bulky water bottle or container I would say. Why they stop selling that, I want one so badly! Ended up I got myself this portion water bottle, was too thirsty when I get this bottle and after I had a sip on it, I just realize the water bottles with better design are selling at the same price. Smack, I should just get something better than this? After those should-not-miss-rides in USS, we just wandered around and enjoyed some shows. The Lights, Camera, Action that hosted by Steven Spielberg is quite good, he is really an awesome film maker and get there yourselves to see the movie magic. Before we left, we did some shopping there and the minion shop really make people crazy on. I didn't get myself anything except for the water bottle, I spent a lot to get my sister a bumble bee mug, now I'm regret for not getting one myself even I know I won't use it, just to keep it. When we were about to left the place, the street entertainment is shown, and bubbles are everywhere, the best shot I got is this lol, lame not? It's really a good place and now I understand why people wanted to go there badly, for me, I'll definitely go back again for more rides and will only go there during weekdays to avoid the queue. Perhaps I should try those rides I missed on my next visit. Finally made up my mind to write about my past Singapore trip during birthday month, here come a teaser before I really post places and food that I went and had over there. It was a not so impromptu trip, I just realized I didn't spend much during the trip as all were within our budget and I managed to get some haul there, if you notice my Instagram. My first time there, so I decided to explore the place thoroughly by our own, instead of calling friends to meet up during the trip, hope that those who stay in Singapore would understand me. Call you up during my next visit, most probably year end? Haha. Since I visited most of the visitor spots, I guess I'll have more time to meet up with friends if I happen to be there again. It was a 3D2N trip, a bit too rush for us as we wanted to go every places that recommended, I can't feel my legs on the second day and so on. So if you haven't been there before, try to make it a relax trip, go only places that you really want, after-all Singapore is so near to us, you can go plenty of times if you want to. I stay in a food heaven, but I must say I love some of the food in Singapore! Should started to plan my next trip! My saving plan too!